Mining is the theme of more than a few online slot machines and with Dwarf Mine from Yggdrasil Gaming we’re joining our stout, red-haired friends to see which gems we need to find to unlock the free spins and expanding reels. 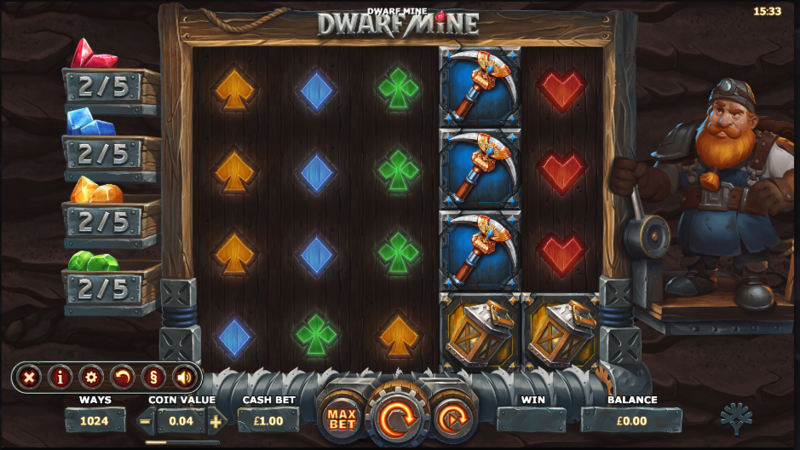 Dwarf Mine is a five reel slot with four rows and 1024 ways to win in the base game; the symbols spin on what looks like some sort of rock crusher, activated by the cheery dwarf on the right hand side. Crystals are collected on the left hand side, something we’ll explain shortly. The higher value symbols include crystals in red, blue, yellow and green, a helmet, a pickaxe, a lantern and a spade; wooden playing card symbols make up the lower values. There’s no wild in Dwarf Mine but there’s a drill bonus symbol which activates two of the features. The bonus symbol appears on reels one, three and five and each one which lands will expand the reels by one row downwards; landing three bonus symbols on the same spin will expand the reels to their maximum size of seven rows and award ten free spins. Unfortunately it’s not possible to trigger any more regular spins from within this round. 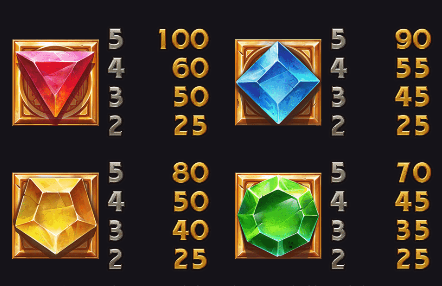 Once the reels have expanded up to two extra rows it’s possible that Collectible Crystals may appear in the expanded areas; these crystals go towards filling up the appropriate boxes on the left hand side (the game starts with two in each box). When a box is full you’ll receive five free spins with extra high value symbols matching the collection colour added to the reels. Yggdrasil slots always look great and Dwarf Mine is no exception with it’s subterranean atmosphere and contingent of busy dwarfs; the features are creative and enjoyable, particularly the expanding reels and Collectible Crystals.